Brightmoor Kitchen. Photo courtesy of Brittany Bradd. In the northwest area of Detroit, residents of the Brightmoor community are preparing to open the neighborhood’s first-ever commercial kitchen and community gathering space. The Brightmoor Artisans Community Kitchen is scheduled to open at the end of April, and with it will come a wave of local gardeners-turned-entrepreneurs. Brightmoor has been known in past years as a food desert–the kind of place where, for many children, an after-school snack meant a trip to the liquor store for a sugary soda and bag of chips. But things are changing now. Healthier options grow in individual and community urban gardens throughout the four-square-mile neighborhood. Brittany Bradd is Program Manager of the Brightmoor Artisans Community Kitchen, a project facilitated by established community organization, Neighbors Building Brightmoor. 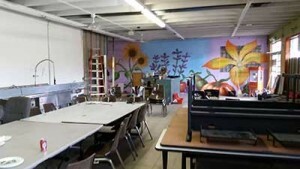 The idea for the Kitchen, which is located in the center of Brightmoor’s “Farmway” area, first came about around 2014 in response to a surplus of produce. In 2006, the Brightmoor Youth Garden was founded as a way to fight blight and drug trafficking in the neighborhood, and in three years the size of the garden went from one city lot to six. In 2009, the Neighbors Building Brightmoor was created by families involved in the Youth Garden, and the organization was granted 501(c)(3) status in 2011. Bradd says many residents are already familiar with cultivation and sales. Many neighborhood youth regularly sell produce at the Brightmoor Farmers’ Market. While the goal is for the Community Kitchen to eventually become its own non-profit organization, it’s currently a subset of Neighbors Building Brightmoor. The area’s residents have transformed many of the blighted, vacant lots scattered throughout Brightmoor, into gardens abundant in both financial potential and nourishing produce. However, due to Michigan’s Cottage Food Law, the moment any of that produce is processed, it cannot be sold for money unless it’s prepared in a certified and inspected commercial kitchen. Bradd says it’s a matter of legality and health code regulations. It’s also why the Kitchen will increase the economic capacity of the neighborhood gardens. “You can have a bundle of tomatoes you can sell for a dollar, but if you turn those tomatoes into pasta sauce, now it’s a value-added product and you can sell it for $6, so it increases the worth of your food and exponentially increases the shelf-life of your food,” Bradd explains. With just one month until the Brightmoor Artisans Community Kitchen opens, Bradd says some of the details are still being worked out. But, she says annual membership is likely to cost around $40, and space and time in the kitchen will be sold separately to both members and non-members. Bradd says the space will, of course, have a commercial kitchen, but will also have an education and meeting area for youth programming and eventually, a cafe. Bradd says for now, the cafe area is taking a backseat to getting the other components of the space, but she envisions it as a place where Brightmoor’s young people can come to work on homework, or work behind the counter for some extra cash. Brad says the space, which was acquired through the Wayne County tax foreclosure auction in October of 2014, had some initial issues, including a leaky roof, water damage and stripped utilities. She says funding for youth programming, employee salaries and kitchen equipment came from various grants totaling $150,000. However, the funding to repair the building and transform it into a welcoming space, came from private donations through crowd-funding websites. For now, Bradd says the focus is on uplifting the Brightmoor community, but she says that’s not because the other areas of Detroit don’t matter, her and the others members of the Brightmoor organization just haven’t gotten there quite yet.